LIMA, Peru (CNN) -- A Peruvian air force plane carrying civilians fleeing El Niño-driven floods crashed into a canal that cuts through a shantytown in the northern city of Piura Sunday morning, killing at least 28 people. President Alberto Fujimori told reporters that 28 passengers died, 15 survived and seven were unaccounted for. The five-member crew survived. Fujimori said some passengers walked away from the wreckage with minor injuries. There were no reports that anyone on the ground had been killed, but at least two people on the ground were reported injured by flying debris. The Russian-made Antonov plane lost power in one of its engines and crashed into a canal running through the center of Primavera, a shantytown of 5,000 people a few miles from Piura's airport. 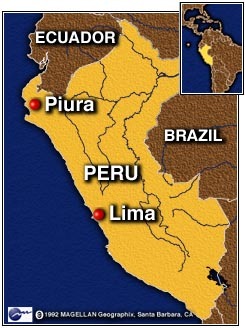 Piura lies along Peru's desert coastal strip, about 530 miles (850 kilometers) northwest of Lima, the Peruvian capital. Fujimori said the pilot had radioed the control tower after the engine had stopped working and said he would try to land. "(The pilot) was trying to reach the airport, and he kept losing height. To avoid falling onto houses, he crashed the plane nose-first into the canal," Fujimori told a Peruvian radio station. The pilot's attempt to land the plane likely avoided a much worse disaster. The crash site was just yards from some of the homes. However, as the plane dropped down over Primavera, a propeller clipped and damaged three houses. In the first moments after the crash, townspeople pulled some survivors from the wreckage. "I was looking at the scenery when I suddenly heard a loud bang and felt the huge crash. Then I didn't even realize I was covered in blood, but I crawled out as quickly as I could because I was sure the plane was about to explode," said Christian Miranda, one of the survivors. Firefighters sprayed the fuselage to prevent the plane from bursting into flames. The plane was carrying people stranded by El Niño-driven floods from the city of Tumbes, close to the Ecuadorian border. They were being taken to Piura by plane because landslides and floodwaters had blocked land routes. 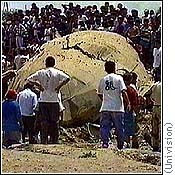 Peru has a grim history of plane crashes. Almost 200 people died in 1996 alone in two air disasters involving private airlines.